The plagioclase feldspar with an iridescent play-of-color that is often used as a gemstone. Labradorite: Photograph of labradorite gemstones exhibiting a beautiful labradorescent play of iridescent colors. Photo by Joanna-Palys copyright iStockphoto. Labradorite: A specimen of labradorite feldspar rough about four inches across exhibiting a beautiful play-of-color. Collected near Nain, Labrador, Canada. Color Usually clear, white, or gray in reflected light. Labradorescent colors can include blue, green, yellow, orange, and red. 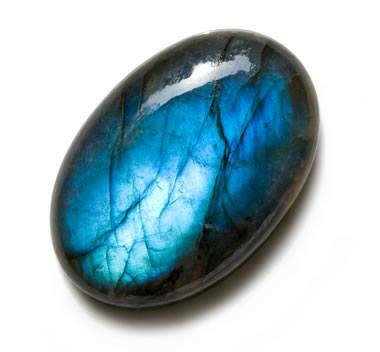 Blue labradorite: Photograph of a labradorite cabochon with an electric blue play-of-color. Photograph by Joanna-Palys copyright iStockphoto. Labradorite is a mineral in the plagioclase series, and it shares many of the properties of plagioclase minerals. It has a Mohs hardness of about 6 to 6 1/2 and two distinct directions of cleavage that intersect at an angle of about 86 degrees or 94 degrees. Plagioclase minerals frequently exhibit twinning and striations on cleavage faces. 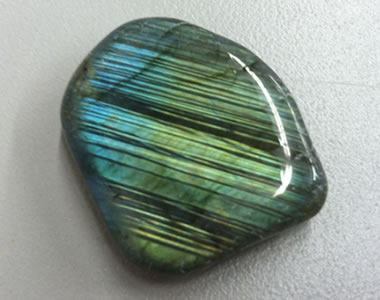 Labradorite is the only mineral in the plagioclase series that exhibits strong labradorescence; however, many specimens of labradorite do not exhibit the phenomenon. Without seeing labradorescence, distinguishing labradorite from other members of the plagioclase series can be difficult. The methods used for distinguishing them are x-ray diffraction, chemical analysis, optical tests, and specific gravity determinations on pure specimens. Sunstone: Much of the gem-quality feldspar mined in Oregon and sold as "Oregon Sunstone" is actually labradorite feldspar. Oregon Sunstone: Close-up photo of a beautiful cabochon showing flashes of aventurescence caused by light reflecting from the copper platelet inclusions within the stone. Some of this material is labradorite and known as "Oregon Sunstone." 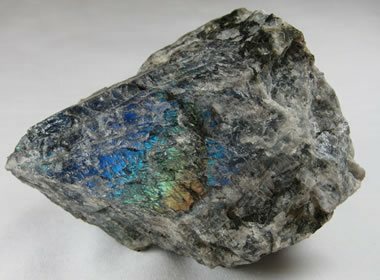 Labradorite has become a popular gemstone because of the unique iridescent play-of-color that many specimens exhibit. The quality, hue, and brilliance of the labradorescence varies from one specimen to another and within a single specimen. Stones with exceptional color are often given the name "spectrolite." Labradorite is rarely seen in mass-merchant jewelry. Instead it is most often used by designers and jewelers who do unique and custom work. Many specimens of labradorite do not exhibit labradorescence. These materials can still produce beautiful gemstones because of their desirable color or other optical effects such as aventurescence. A beautiful orange piece of labradorite cut as a faceted stone is shown on this page. Some specimens of sunstone are labradorite. Sunstone is a plagioclase gemstone in which tiny platelets of copper or another mineral are arranged in a common orientation. These platelets produce a reflective flash when incident light enters the stone at a proper angle relative to the angle of observation. Some cautions are required when using labradorite as a gemstone. It breaks in two directions with perfect cleavage. This makes it subject to breaking with impact and not a good candidate for jewelry or other objects that could be subject to impact. It also has a hardness of 6 on the Mohs scale. It will therefore scratch much more easily than diamonds, rubies, sapphires, and emeralds, and slightly more easily than jasper and agate. Labradorescent material is most often cut into cabochons. The labradorescence phenomenon is best exhibited when the base of the cabochon is parallel to the layers in the material that produce the labradorescent flash. Careful study of the material is required so that the finished stone will be oriented to produce a full "face-up color." If the stone is cut at any other angle, the layers that produce the labradorescence will be inclined when the stone is viewed from directly above. This will yield a labradorescent flash that will appear to be off-center. Tumbled labradorite: A tumbled stone of labradorite with very strong twinning (the parallel lines of color within the stone). The material used to make this stone was produced in Madagascar. 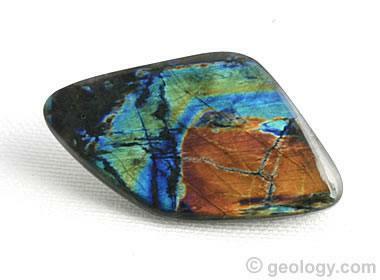 Labradorite is found in igneous, metamorphic, and sedimentary rocks. 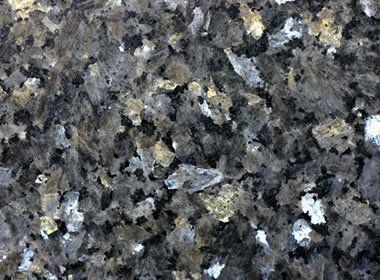 It most often occurs as a primary mineral in mafic igneous rocks such as basalt, gabbro, and norite. It is also found in anorthosite, an igneous rock in which labradorite can be the most abundant mineral. Labradorite occurs in gneiss that has been produced through the metamorphism of labradorite-bearing igneous rocks. It is also found in sediments and sedimentary rocks that are derived from the weathering of other rocks that contain labradorite. Anorthosite: Anorthosite, a rock rich in labradorite, is often cut, polished, and used as an architectural stone. It is sold under a variety of names such as "blue granite" or "labradorite granite." It is used as countertops, tiles, window sills, and facing stone. A building faced with labradorite-rich rock can be a spectacular sight when the sun hits it at the right angle. Millions of labradorite crystals reflect brilliant color flashes in various directions. This makes the building glitter colorfully in the sun as you drive or walk by. Image copyright iStockphoto / Theanthrope. Labradorite with superb labradorescence is produced from a few deposits in Finland. The best of this material was given the name "spectrolite" by the director of the Geological Survey of Finland. Today, specimens of labradorite with exceptional labradorescence from other locations are frequently called "spectrolite." A significant amount of gray to black labradorite with good labradorescence is produced from locations in Madagascar and Russia. Small amounts of transparent labradorite with internal color flash are produced in India. Several mines in Oregon produce transparent orange, yellow, red, blue, green, and clear labradorite without labradorescence. These can be cut into very nice faceted stones. Some of this material has platy inclusions of copper in a common alignment that can produce an aventurescent flash when played in the light. These materials are marketed under the name "Oregon Sunstone" and have attracted a strong following from local designers and the tourist trade. Meet the Feldspars: The gem kingdom's next rock star dynasty; Joel Arem, Colored Stone Magazine, November-December, 2009. Some deposits of anorthosite are quarried and cut into slabs that are used to manufacture small sculptures, countertops, window sills, tiles, facing stone, and other architectural products. A photograph of a polished surface of an architectural stone known as "blue labradorite granite" is shown on this page.